Residents line up to give their opinions at the Board of Finance hearing. 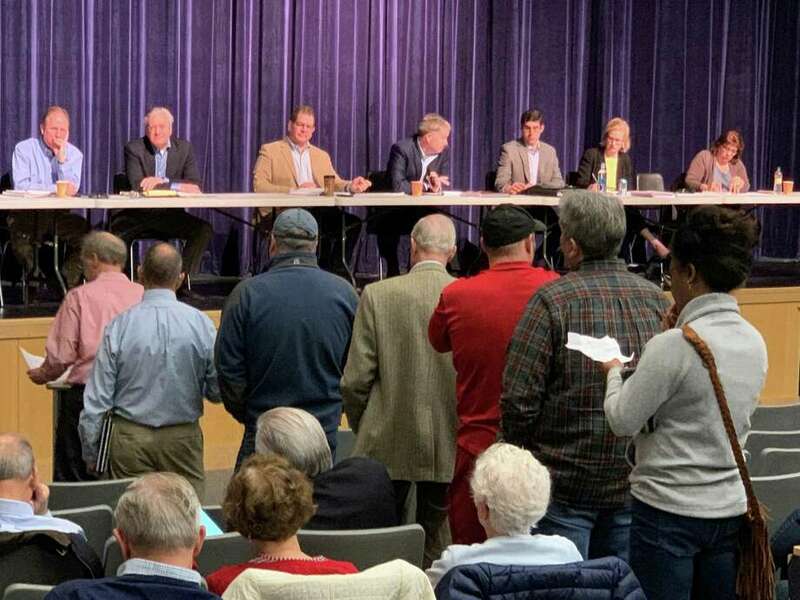 The Board of Finance held a public comment session last Saturday, giving residents an opportunity to comment on the recently proposed fiscal year 2019-2020 annual town budget, with student and senior citizens among their top concerns. New this year, the Board of Selectmen and Board of Finance held two separate budget hearings. The Town of Fairfield’s budget process begins in January and ends in May. Held in the Fairfield Ludlowe High School auditorium, dozens of concerned residents lined up to the microphone to have their voices heard; each was allowed a max of two minutes. “We face several ongoing challenges,” said Tetreau. “Municipal aid was reduced by $4 million over the last several years, including a $2.5 million reduction in Educational Cost Sharing funds. Our tax revenue is still short the almost $2 million from the sale of the GE property to tax exempt Sacred Heart University. These funds are not coming back. Our goal is to mitigate the ongoing impact of this revenue loses on our residents.” Tetreau noted an additional challenge being the Trump tax plan. On March 13, the Board of Selectmen unanimously approved Tetreau’s recommended budget of $317.5 million, an increase of $12.5 million from the current year, which also called for a $700,000 reduction in the BOE’s request. School employees’ salaries are expected to cost the town approximately $112.7 million. The Representative Town Meeting approved $2.6 million in school capital projects, expected to improve district wide infrastructure. The first selectman’s recommended budget includes on the town side a recommendation of $136.1 million - an increase of 3.54 percent over last year. Also recommended is a Board of Education budget of $181.7 million - a 4.6 percent increase over last year. This is a $700,000 reduction in the original BOE request of $182.3, a 5 percent increase over the current fiscal year. The BOE budget represents 57 percent of the town’s total budget and is the largest driver for the total tax increase. “Due to a projected tax sale,” said Tetreau, “use of certain reserve accounts and grand list growth of almost 1 percent, the projected mill rate for this budget is 26.95 (2.24 percent increase).” It was noted by DeWitt, “We do not put together this budget, our CFO and his staff put together this budget.” The BOF is expected to vote on the budget April 3. The Representative Town Meeting will hold budget hearings throughout the month of April and is scheduled to vote May 6.